Asking someone to come into your home to provide a service, whether that is pet sitting, a weekly cleaning service, or any other service, requires some level of trust. After all, if you have a cleaning service come to your home once a week, you’re trusting they won’t steal your jewelry or stain your antique furniture. Even if you have a neighborhood teen come by and walk your dog when you go out of town, you’re trusting that he or she won’t think it’s a brilliant idea to throw a massive party in your home or raid your liquor cabinet. So, when it comes to hiring home healthcare, you are placing an even greater level of trust in a person or service because you are trusting them with something infinitely more precious – your loved one’s well being. If this sounds too much like a job interview question, that’s because it is. You’re hiring someone to come provide occupational therapy, physical therapy, and/or medical care in your home, so you’re trusting that individual or service with both your loved one and your home. If a potential home health aide has never worked in home care before and your loved one has delicate medical needs, they probably aren’t the right person to hire. On the other hand, a nurse or CNA with years of experience in other home care positions could be an excellent hire in terms of experience alone – though you may want to see how quickly they go from one position to the next. How are you qualified for our needs? This question is meant to expand on the previous one. Not only do you want to be sure you’re hiring someone with the requisite training to provide the care your loved one needs, you’ll also want to ask about more specific training, qualifications, and experience. If you’re looking for pediatric occupational therapy help, it hardly makes sense to hire someone who only has training and experience working with the elderly. If your child or elderly relative needs medical care, whether it is acute or long-term, be sure you ask about the home care candidate’s qualifications for the specific medical services you need – and don’t be afraid to ask to see their license or other credentials. Anyone properly trained and licensed will be ready to hand those over with no qualms. Asking for their specific interest in working with your loved one will show you the difference between someone who is simply looking for a job they are qualified for and someone who is more likely to be patient and compassionate because they are working in a field they love. Of course, personality needs will vary depending on your loved one’s cognitive abilities and social needs. If you’re hiring a home healthcare aide to provide companionship and small assistance to your elderly loved one, you will likely want to choose a candidate who will be sociable. On the other hand, if you’re looking for home care for a child with severe mental disabilities and a lot of medical needs, a great deal of patience will be more beneficial than a social nature. How comfortable are you with my loved one’s mental state? Whether you are searching for elderly or pediatric home health care, this is a vital question. If your elderly parent or relative is struggling with dementia or Alzheimer’s, they may be prone to mood swings, frustration, sadness, and confusion – all of which can be difficult for some people to be around every day. Similarly, a child with severe mental development issues may have a hard time communicating needs and have unexpected strength, which usually calls for someone with patience and compassion to help out. Give a general outline of your loved one’s mental state and ask the candidate to talk about how comfortable they are with those limitations. If it’s feasible, you may want to introduce any strong home care candidates to your loved one and let them spend a bit of time together. This will give you a helpful glimpse at how the two will get along. Are you willing to try a trial period? After you’ve gotten to know the potential home healthcare candidates better and you have one or two strong options selected, it may help you and your loved one feel more comfortable to begin with a trial run. Ask your chosen caregiver if they’re willing to undergo a trial period of a week or two. If the caregiver and your loved one get along well and they feel like a good fit, you have your home healthcare aide. If either your loved one or the caregiver isn’t fully comfortable with the role and needs, you probably won’t want to keep that person on long term. 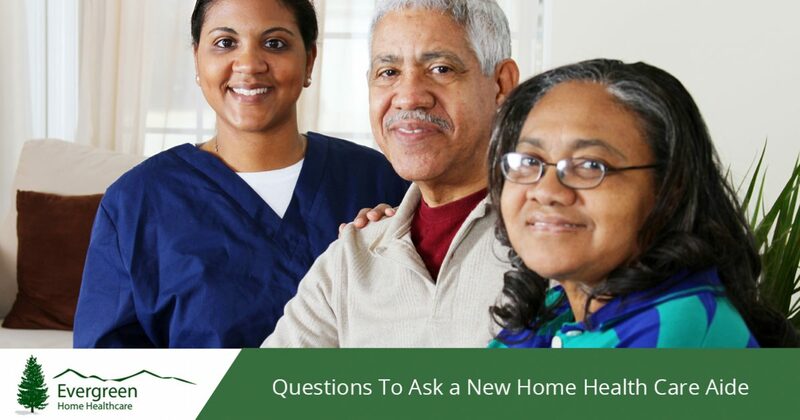 On top of the above “get to know you” questions, you will also want to discuss the other job basics before you hire a home healthcare provider. This includes things like asking what their weekly availability is (and whether they have any planned vacations), asking for references, checking that their licenses are up to date, and running a background check. To be sure you’re hiring a caregiver that has the experience, training, and compassion to provide the home care your loved one needs, choose a trusted home healthcare service like Evergreen Home Healthcare, located in both Fort Collins and Westminster. We go through a rigorous hiring process before we match patients with caregivers, so you know you’re getting home care help you can trust. Contact Evergreen Home Healthcare today to get started!